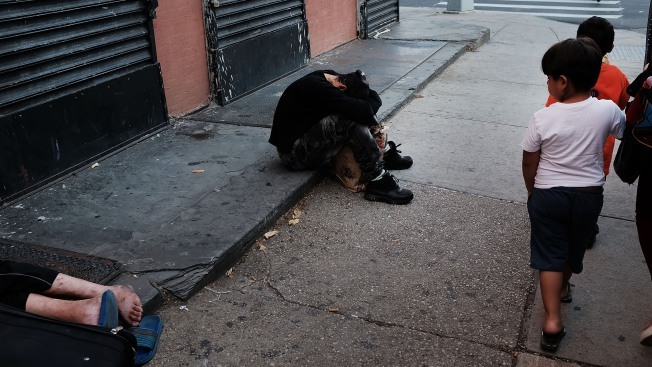 Children walk by drug users passed out along a street in a South Bronx, which has the highest rate of heroin-involved overdose deaths in the city, in October 2017. Tune in for "State of Addiction," a special week-long investigative series beginning on Monday, Dec. 11 on News 4 New York. There are many places to turn if you or a loved one has an addiction. Here's the breakdown of trusted resources for residents of the tri-state area. The Substance Abuse and Mental Health Services Administration, a branch of the U.S. Department of Health and Human Services, has a services locator that maps out facilities for substance abuse, mental health and health care. It also has a helpline: 1-800-662-HELP (4357). For parents, this guide put together by The Partnership for a Drug-Free America could be useful in speaking with children about drug use. Individuals seeking support or treatment for substance use issues for themselves or their loved ones can contact the number above or head to nyc.gov/nycwell. Free, confidential support is available at any hour of the day in over 200 languages. To prevent overdoses, search this map for where you can get naloxone at participating pharmacies and Opioid Overdose Prevention Programs throughout the city. Here's a list of pharmacies that cary naloxone without a prescription. Find out where you can get clean syringes using this list. The state Office of Alcoholism and Substance Abuse Services has a Combat Addiction page with plenty of resources for New Yorkers. It includes lists of addiction treatment services and mobile clinic services. You can also find a regional support service, like a recovery center or family support navigator. Another New York OASAS page breaks down many treatment services and providers. ReachNJ is a great resource with helpful information about addiction and getting help and support on the road to recovery. Here's a list of recovery centers and support groups in the state. The Department of Health has a resource page that includes frequently asked questions, helplines, and information on services for prevention, internvention, treatment and recovery. Scroll to the bottom of this page for a map of addiction treatment centers in the state. The Department of Mental Health and Addiction Services has a page dedicated to explaining the types of services offered to people in the state. Use this list to find addiction services near you. And here's a list of state-operated inpatient treatment facilities and a list of crisis centers.